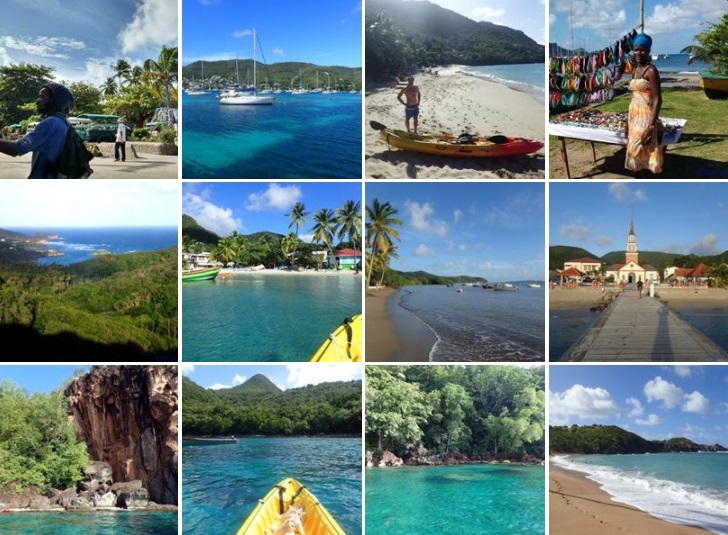 Exploring the Caribbean by kayak is an original idea, and a great one too. You can do it in different ways: the easiest one is to rent a kayak when you get to an island; the most adventurous one is to find a good kayak and paddle from one beach to the next, camping in wonderful places. What I did when sailing the Caribbean by catamaran was to keep a kayak right on the boat. We rented it in Martinique for 2 weeks; the kayak stayed comfortably on the catamaran, and actually it was very photogenic. As soon as we anchored, I dropped the kayak in the water and we started exploring beaches and cliffs, or we used the kayak to go swimming where the water was crystal clear. 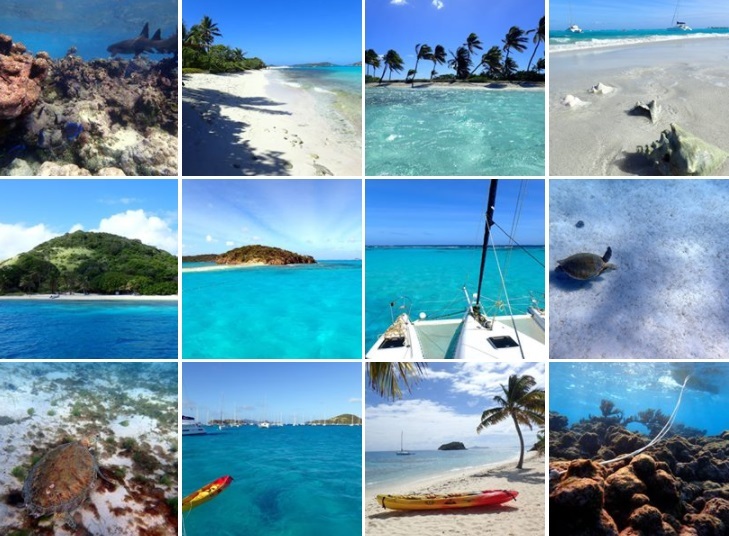 Here below you can find a list of the most beautiful kayaking destinations in the Caribbean (in particular in the Windward Islands). (For the map and general info about the trip click here: holidays in the Caribbean). Antigua has a diamater of 25 kms, so you could even paddle all around the island in a few days. The suggestion, in this case, is to be brave, strong, smart and to do the itinerary clockwise: this way, the big ocean waves will come from behing in the few parts of the coast not protected by coral reefs. The reward of such a feat? Amazing scenery! 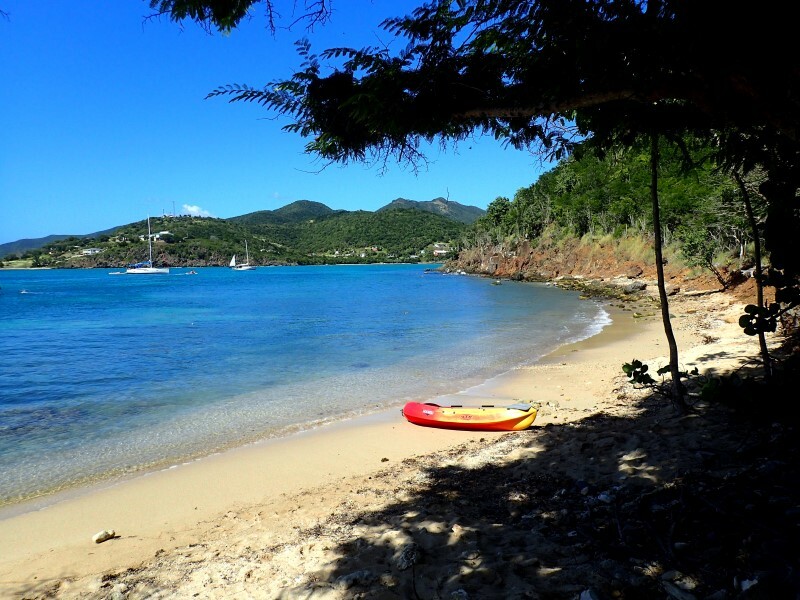 Guadeloupe is an island full of different landscapes and it offers several interesting kayaking itineraries. The leeward coast, not beaten by the Atlantic waves, is the best for kayaking, especially at Cousteau Reserve and Deshaies. However, also the southen coast of Grande Terre is great, with white beaches and picture perfect water. 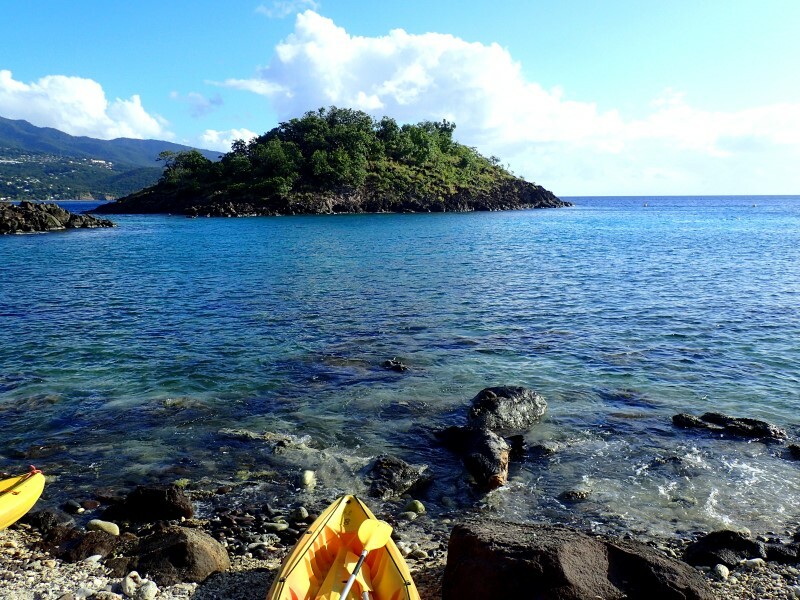 The small Les Saintes islands, just to the south of Guadeloupe, are another amazing place to paddle. Here a kayak can be even considered a very useful way of transport among the islands. Martinique is a quite large island that offer several points of interest. As usual the leeward coast (the one that is not beaten by the Atlantic Ocean waves) is the best for a travel itinerary by kayak. The ideal places are to the north of Saint Pierre, where the coast is wild, with black sand beaches and thick jungle, and to the south of Fort de France, with beautiful bays like Les Anses d'Arlet: white beahces, red cliffs, green vegetation, light blue and clear sea, ideal for snorkeling. Also the windward coast is beautiful and in some places it is protected by barrier reefs or rocky capes. A very good examples is the fascinating peninsula of the Caravelle. These islands are wilder than Martinique and they offer, on the leeward coast, several beaches that can be reached only by sea, ideal places for a travel itinerary by kayak and for camping (for the most adventurous travelers). Under palms, cliffs or thick jungle, with your kayak you will feel alone in the nature, and you'll look around hoping not to see any Pirates of the Caribbean. At Saint Lucia, the most beautiful places are the Pitons and Soufrière (and the sea is fantastic up to Chantemerle, where you can have excellent snorkeling). At Saint Vincent you have a lot of options: Chateaubelair offers a beach with a quaint village, a rocky islet, and beautiful cliffs covered by palms and other vegetation; Wallilabou and Cumberland Bay are very picturesque; to the south of Wallilabou, several other deserted bays with secluded beaches of black sand can be visited by kayak. These awesome islands are at a short distance from each other and a crazy skilled kayaker could even organize a travel itinerary from Bequia to Grenada (of course between the islands he/she would have to battle against waves and wind). The boat+kayak solution is more comfortable. Those who can't use a big catamaran may also consider an inflatable kayak, but the frequent wind is not friendly to this type of canoes. Islands such as Bequia, Mayreau and Union Island boast beautiful beaches, quaint villages and view over the Caribbean vegetation. Also the Tobago Cays are amazing. These tiny islets form a natural park. Here the kayak becomes a perfect "vehicle" to go from one island to the next or to reach the corel reef and snorkel with colourful fish, rays and turtles. When I paddled towards the reef and the open sea, with the Atlantic Ocean waves breaking on the barrier, and then I snorkeled and a two-meter shark swam just in front of me... it was one of the most exciting moments of the whole trip! Then go visit the pages with info dedicated to travel itineraries in the Caribbean and to sailing trips in these amazing islands. You can also get specific info about Martinique, Saint Vincent, Saint Lucia, the Grenadines and Tobago Cays.